I used to play racquetball . . . a lot and for many years. In all that time, I’ve gotten annoyed a number of times. I got mad a few times, usually due to disputed calls; while expected to always cede a close call to the other player, I would get tired of having my calls challenged. 99% of the time, my calls would be challenged by lesser players and while it pissed me off, it also motivated me to humiliate them on the court. But, that part was never fun. Mind you, I like to win, but I don’t mind losing and the primary goal was to have fun. When someone would piss me off, the game was not fun. The fact that I could clean someone’s clock didn’t make up for the fact the game was no longer fun. Anger and resentment have few benefits. In all the years I played, I only walked out of the court once (forfeiting the league match in the process). This was against a player I could easily beat and who had very poor court sense. After getting in front of my shot twice — meaning, he stepped in the path of a ball and got hit twice in one game — he accused me of purposefully hitting him and demanded my word I wouldn’t hit him again. Words ensued and I quit the game I was winning (the second game), forfeit the match, and resigned from the league (because I’d eventually had to play him again). As an aside, in the last few years that I played, I became very selective about who I played specifically because the class of players changed (as in, fewer and fewer had any class). I loved racquetball. I wrote about it HERE but the words cannot fully express my love for — and appreciation of — the game. Quitting the game was a difficult but necessary decision. But, again, it was never about being the best or destroying an opponent . . . it was always about enjoying the match. Why am I writing about it here and now? Well, I read two different articles about the Serena Williams blow-up at this year’s U. S. Open. These were the articles: HERE and HERE. Before I give you my opinion, let me tell you about the other 1% . . . the times better players than me called balls short or challenged my calls. Invariably, it was when they were in trouble. It didn’t happen often, but if I was having a good day and they were having a bad day, I could count on all sorts of annoyance in the form of spurious hinder calls, calling serves bad, calling kill shots short (mine) and short shots kills (theirs). It wasn’t all better players . . . just two, in particular, were very bad at this “gamesmanship” and I won’t name them because it serves no purpose. Suffice it to say I avoided playing them as much as I could (sometimes I played doubles and it was unavoidable). I stopped playing them in singles because it just wasn’t worth the aggravation. Let me be clear about this . . . at Lynmar (Colorado Springs), before the club went downhill, the place had an amazing group of players as members, some nationally known. I played nationally ranked players in Michigan too, so it’s not like Colorado was unique. These were players that could keep me to a couple of points a game on days when I was playing my best. I loved it. They were generous players and they’re the reason I always made it a point to play people below my skill level whenever anyone asked. Not for the easy win, but to play a part in the improvement of other players. But, these two other players . . . not so much. They wouldn’t “bother” with lesser players. They only started playing me when they saw I could mount a bit of a challenge . . . but not too much. Those two players, I hold in contempt as players and by extension, as individuals. So, where do I come down on this whole Serena Williams “incident”? She disgraced the game. She should have apologized for her coach signaling and accepted the fact that on that day, that court, she would lose to a player who deserved better than what she got. Serena robbed Naomi Osaka of the opportunity to enjoy a crowning achievement and the momentous event of her career to date. On that day, she was not a champion. She was a petulant individual unaccepting of the fact she was being outplayed. She showed no class in playing the victim’s card. She’s still (possibly) the greatest female player of the game, but this incident will forever change my opinion of her as a player and as a person. I’m very unforgiving when it comes to certain things. And, in case it’s not clear, I think the writer of that first article — and her reasoning — is full of a substance typically found on open ranges. This treatment, for some reason, seems a bit on the demonic side . . . 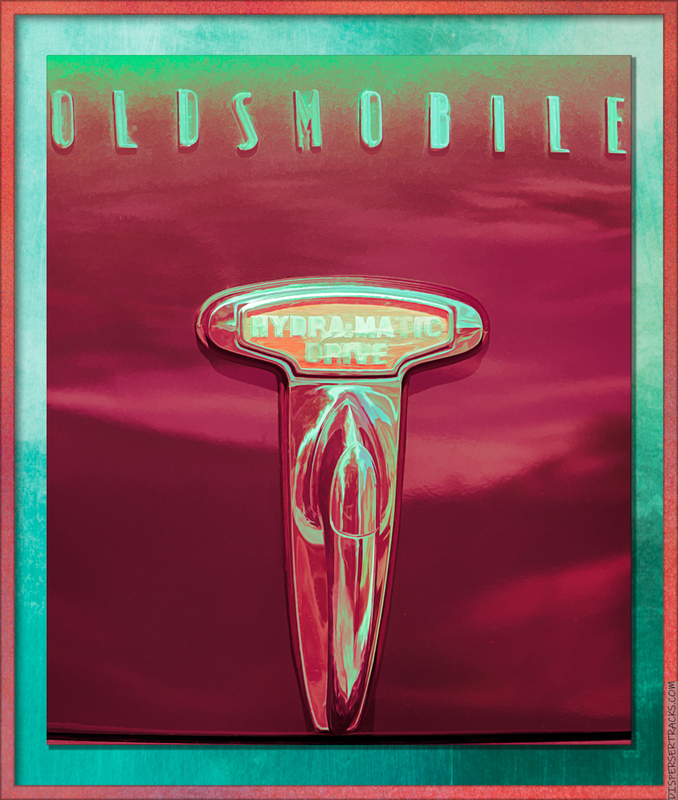 I hope that the Oldsmobile marquee is not suffering in hell because it doesn’t deserve it. It may have suffered a bit in latter years, but that rests more on GM’s shoulders. Many things are judged by different perspectives, and this we should perhaps remember more often than we do. And here, an animated trip down memory lane with the . . . Layered Amoeba with Measles Variations gif. I could never imagine you playing any sort of sport, in fact you’re the last person. I wonder why I think this; I have little doubt you’ll tell me and explain where I am deficient in my understand of your complex nature; or some such nonsense (((HUGs))) HA! Racquetball, archery, shooting, bowling, tennis, basketball, soccer (football in your part of the world), golf, table tennis, badminton, are things I tried and liked and was reasonably good at. As a goalie, I was pretty good at dodgeball. There might be more I don’t remember right now. But, yes, you are deficient as to the understanding of my nature . . . sadly, you’re not alone. I suppose that was all before you met Melisa and decided there was more to life than kicking throwing or bashing with a lump of wood a ball. I don’t do as much “sports” but we still go to the gym five days a week for 90 minutes of lifting weights, rowing or biking and I do throw a medicine ball around. I can still play golf and shoot and I could probably play racquetball but don’t want to risk injuring myself again. PHOTO: I like those colors! CARTOON: HA! Perspective is everything. DOODLE: Poor amoeba! Measles are a bummer!